Thanks to Minnesota North Country Trail champions Sen. Amy Klobuchar and Rep. Rick Nolan, the North Country National Scenic Trail Route Adjustment Act legislation has been re-introduced in the 114th Congress, with the co-sponsorship of Sen. Al Franken and Minnesota members Reps. Peterson, Ellison, Walz, Paulsen, and McCollum. This simple, bipartisan legislation (H.R. 799 & S. 403) would officially approve the North Country National Scenic Trail’s (NCT) “Arrowhead Re-route” in northeastern Minnesota. It would also extend the NCT into Vermont to the Appalachian Trail—the original concept in the late 1970’s. The “Arrowhead Re-route” would replace the NCT’s original route—100+ miles through pretty wet country between Jay Cooke State Park and Remer (completely un-built after 35 years) with a fantastic new route through Minnesota’s “Arrowhead.” The new route uses the Superior Hiking Trail and the Border Route and Kekekabic Trails within the Boundary Waters. The last piece would be 150 miles of new NCT to link the Kekekabic Trail with the existing NCT near Remer. Since 2004, the North Country Trail Association (NCTA) and our friends in Minnesota and elsewhere have been advocating for the re-route legislation in Congress but, despite ample local support and no opposition, all previous efforts have failed. We are off to a good start in the 114th Congress with early introduction of the bills, 15 bipartisan co-sponsors of HR 799 and 9 bipartisan co-sponsors of S. 403, and a Senate sub-committee hearing. The NCTA still aims to recruit many more co-sponsors and, in particular, more republican co-sponsors. Targets in our area include Rep. John Kline (MN-2), Rep. Tom Emmer (MN-6), Rep. Sean Duffy (WI-8), and Sen. Ron Johnson (WI). With six of eight Minnesota congressmen and both senators on board, it would be great to count the entire Minnesota delegation. 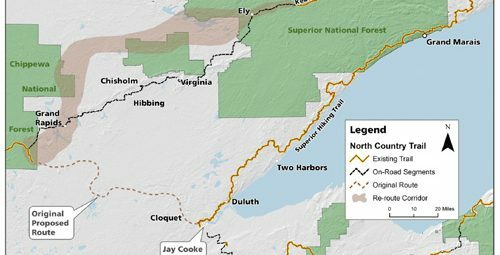 The NCTA is asking hiking, Boundary Waters, and state park supporters who live in northwestern Wisconsin and Minnesota’s 2nd and 6th districts to make constituent contacts. People simply need to contact their representative and/or senator and ask that they support the legislation and co-sponsor it. Be sure to tell them why this legislation is important to you. 2. If your Representative or Senators are not co-sponsors, please contact them and ask that they support the legislation by co-sponsoring it. Here are some talking points.